We love chips and dip at our house and probably the easiest dip we all love is a queso dip. 'What's queso?' you may ask? Queso is a creamy, zesty dip, it’s SO good—make it the next time you have a few friends over to watch football! It's easy to make with VELVEETA cheese & RO*TEL diced tomatoes and green chilies. Simply combine, heat up, stir and serve up with chips! Half the country has never even heard of Queso! If you love Queso, help spread the word by joining the conversation on Facebook, Twitter, and Instagram by using #quesoforall. As much as I like Queso dip, I also especially like making chili for our tailgating parties. 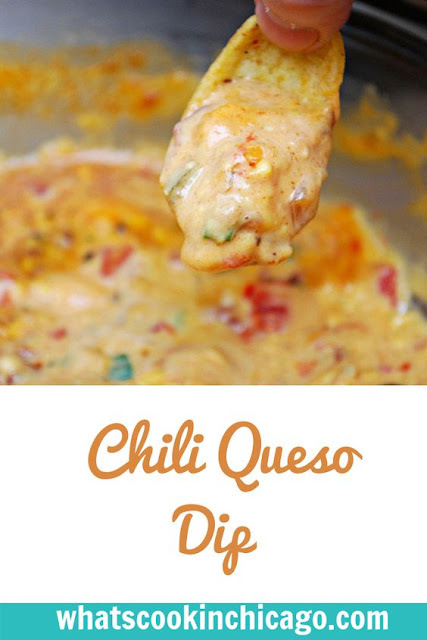 I wanted to incorporate into a dip, so in this case, I stirred it in the traditional queso for a whole new spin on a classic favorite. The next time you entertain, serve the crowd-pleasing Famous Queso Dip made with just two ingredients; creamy VELVEETA & RO*TEL diced tomatoes and green chilies. Serve it as-is or throw in your own twist by using one of a few kinds of VELVEETA flavors, your choice of RO*TEL diced tomatoes and green chilies, and even toss in something extra like chopped vegetables, sliced sausage, crumbled bacon or whatever inspires you! 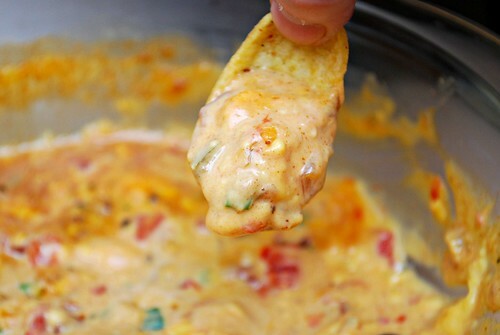 If you love your cheese dips, be sure to check out www.quesoforall.com for the Famous Queso Dip and other Queso recipes. The updated Quesobago tour schedule can also be found there and you even get a chance to win a party featuring the Quesobago on football’s biggest game day! Queso fans can enter for the chance to win a party featuring the Quesobago for football’s biggest game by entering at www.quesoforall.com now through November 30, 2013. The winner will receive a party at their home for up to 10 friends. No purchase necessary. Once you’ve entered for a chance to win, share with your friends and score bonus entries. Every time you come back and share via Facebook and Twitter or email through November 30, 2013, you’ll rack up additional chances to win. "What makes Queso the perfect party dip? Leave your comment below for a chance to win a $100 Visa gift card. If you crave more Queso, check out www.quesoforall.com for the Quesobago tour schedule, Famous Queso Dip Recipe, and a chance to enter the sweepstakes for the ultimate football party!" Combine the VELVEETA & RO*TEL diced tomatoes and green chilies in a microwave safe bowl. Microwave the bowl on high for 5 minutes. Remove from microwave; add chili and green onions. Stir to combine and serve with chips. Queso this the perfect party dip because it's easy and quick to make, tastes wonderful, and everyone loves it. My mom made this all the time growing up, so for me it's perfect because it brings back all the memories of my parents "grown up" parties. It's perfect, because it's a classic that's SO easy to make! What makes queso the perfect party dip? The fact that you can throw a block of Velveeta, Rotel, mix some spices and made ahead ground beef into a Crock Pot and in 1 hour, a bowl of cheesey and meaty heaven awaits you. Queso is the perfect party dip because it's a crowd pleaser. Queso is the perfect party dip because it is quick and easy to make, but packs a flavorful punch! Who doesn't love queso??! It's the perfect game day food! I think it is really filling and everyone always likes it! I love that this stuff is completely foolproof - bowl, ingredients + microwave = perfection. It's that good, no one ever complains and it's always gone. It is the perfect dip because its versatile you can add additional ingredients to jazz it up and everyone loves cheese! Queso is easy, inexpensive and most people like it, so it's the perfect party food. SO easy to make and customizeable too. Queso is my favorite party food because it's easy to make and you can add your own ingredients. Queso makes the perfect party dip because everyone loves smooth, creamy sauce, that is made from a blend of melted cheeses. It's so easy to make, delicious and always a hit. I tweeted: https://twitter.com/peg42/status/394954216264826880 Thanks so much. Queso is the perfect dip because it is easy to make and tastes great. Queso is great because it tastes so good and most people at the party will enjoy it. perfect dip because EVERYONE loves it - adults and kids alike! Queso is the perfect party dip because it's easy and cheesy and spicy and delicious. Thanks! It is easy to make. Its perfect fast and easy and yum. Queso is perfect party food but it's also one of my guilty pleasures - any day is a party when there is excellent queso! It is the perfect party dip because it is tasty and easy to make. It's so easy to prepare! Queso dip is perfect because everyone I know loves it so it satisfies everyone. i have never had it, but i think people like it because it is cheesy and zesty. Yum! Queso is the perfect party dip because most everyone loves it. Warm cheesy dip is so comforting, and pairs well with many foods. Your recipe sounds so good! I haven't tried mixing in chili before. We love Queso with Rotel. it is the perfect party dip because it is easy to make, you can make diffrent variations of it and everyone loves it! Queso is the perfect party dip because it's super cheesy (and who doesn't love cheese) and you get lots of flavor from the spices! Plus it's great to sit around a bowl together and talk, it's perfect for conversation. It's a perfect dip because it is so easy and very yummy to eat. Everyone loves it. its the perfect dip because it gos with everything ! This is the perfect party dip because it is easy to prepare. And delicious! It's ingredients and the ease to prepare it make for a perfect dip-so sorry, I missed it at the Michigan State v U of M game. It’s perfect because who doesn’t love Queso? It's cheesy goodness! Whenever I take it to a party it’s always a favorite by all! It's so easy to make! Love it! Because its yummy! Everyone loves it! And its super easy to make! It's the perfect party dip because it's easy, quick, delicious, and sure to please everyone! It's creamy and cheesy - who doesn't love that?! Veggies, crackers, chips -- everything tastes great with this dip. It's the dip that everyone asks for. It's warm and creamy for this changing cooler weather! Queso is the perfect party dip because it is warm and flavorful! It's perfect because you can have so many variations to please everyone. Queso dip is great because just about everyone loves cheese. What makes queso the perfect party dip is that pretty much everyone loves it and it is so easy to make more of if you run out of it. I think its a perfect dip since its cheesiness is super yummy! Queso’s irresistable flavors and my addition of fresh cilantro makes it the perfect party food. Go Bengals! It's easy to make and everyone likes it. It's quick to make and everybody loves it. It is the perfect party dip because it is easy to make and it tastes sooo good! Queso is the perfect party dip because it is so easy to make and everyone loves it. This is easy to use and everybody likes it. It's so quick and easy to make! Queso makes the perfect party dip because it is easy, delicious and just about everyone likes it. Everyone likes queso, so it's an easy fix! I like that queso is spicy but not too spicy, so everyone seems to like it. Everyone likes chips and queso so it makes it easy to serve something quick. Queso makes the perfect party dip because it is easy and yummy and you can change it up simply by varying ingredients so it never gets boring! queso is delicious and so cheap and easy to make! This is the perfect party dip because it's so easy to make and everyone loves a tasty cheese dip! It's not a party without queso. its perfect because it has something in it that everyone loves! Queso made with Velveeta and Rotel is the perfect dip because it has a rich flavor with just the right amount of spice. It's super easy to make and something that everyone likes so it's a perfect for parties. Thank you! Queso is the best party food because it doesn't require eating utensils for one thing. It's warm, delicious, and always hits the spot. It also goes great with any beverage. It is good for a spicy summer party or a cold winter party to heat you up! Good for all seasons! Queso is perfect for any party - and any kind of guests! From spinach to beef - you can customize it to fit whatever you're feeling like! queso is the perfect party dip because everyone likes it and it goes with lots of things. It's perfect because it takes little effort to make. Queso is the perfect party dip because it's so easy to make and you can add things if you want to change it up a bit. It makes the perfect party dip because it is easy, versatile and delicious. It's such a versatile dip, because you can add in any ingredients you may have on hand! Cheesy rich deliciousness makes Queso the perfect party dip. It's easy to make and super yummy! The guys seem to love Queso dip. And it is so easy to use, that you can make it up ahead, even with time constraints, and the men and their guy pals will be very happy. Throw in their fave chips and beverages and they will be satisfied! Love queso because its so simple and delicious. My husband would love it with chili. A big favorite, inexpensive, simple to prepare and salivatingly magnificent! !